I’d like to review those arguments here. While Moodle is still by far the most widely adopted LMS in higher education globally and is no danger of disappearing any time soon, I believe that our data should give the Moodle community cause for considerable concern about their long-term future and should trigger some soul searching about how the community can ensure it continues to have the development resources necessary to continue to be relevant in the long term. Notice the scope of the chart: It does not include the US and Canada. This is data for Europe, Latin America, and Oceania. So this chart is not biased in any way by US-centric trends. There are two important caveats here. First, as Phil states in his post, our coverage of these areas of the world are not as complete as they are in the US and Canada, so trends we see in our data for these parts of the world should be considered directional and somewhat provisional rather than pinpoint accurate. That said, we only publish data for regions where we have enough coverage to be confident that our sample is representative. We don’t yet cover China or Africa for this reason. We believe the chart above is directionally correct, but there is a margin of error because we have a sample rather than a close-to-100% complete data set. So the issue we’re talking about is not that Moodle is disappearing but rather that it is losing ground during new adoption cycles. The e-Literate numbers aren’t global or aren’t accurate. e-Literate is using the wrong adoption measure. e-Literate’s numbers are irrelevant, because an open source project doesn’t need to worry about growth in the same way that a profit-motivated company does. Phil’s earlier post addressed the first objection by describing the data we have, how we get it and validate it, and how we try to be transparent about its limitations. I’d like to address the other two objections in this post. We measure higher education institutional adoptions. That means there are Moodle adoptions that we don’t measure or don’t report. We don’t have counts K12 or corporate adoption at all; Moodle has significant uptake in both of these areas. While we have data on secondary higher education adoptions (e.g., adoption by a school of education at a university that uses a different LMS for the rest of the institution), we don’t report these numbers. Nor do we report adoption by individual faculty. All of these are meaningful numbers and we do not dismiss them. But institutional higher education adoption is a particularly meaningful measure for Moodle’s long-term health. While Moodle is open source, Martin Dougiamas’ company Moodle Pty—more widely known within the Moodle community as Moodle HQ—does most of the development of the core Moodle code and maintains tight control over which code submitted by third parties gets accepted into the code base. This is what is sometimes known as the “benevolent dictator” model of open source, which was popularized by Linus Torvalds, the creator and development leader of the Linux kernel. Under the current way of doing things, both the direction of Moodle development and velocity at which occurs are largely controlled by Moodle Pty. However much input the company may take from the community, the ultimate decisions and, perhaps more importantly for this post, the work of implementing those decisions, fall under the purview of Moodle Pty, a for-profit company that must generate revenue to pay the employees who actually write that code. Moodle Pty’s revenues mostly come from Moodle Partners, which are companies that are licensed to use the Moodle trademark by Moodle Pty in return for a percentage of their Moodle-related gross revenues. If Moodle Partners lose paying customers, then Moodle Pty loses revenue. If Moodle Pty loses enough revenue, then at some point it would have to start laying off developers. If Moodle Pty starts laying off developers, then the pace of Moodle development will slow. If the pace of Moodle development slows, then the loss of Moodle-adopting schools may accelerate, creating a vicious cycle. While we don’t know the percentage of Moodle’s revenues that come from higher education (as opposed to K12 and corporate), we know it’s significant. The anecdotes I have heard from various sources suggest that it may well be the substantial majority of the total financial resources that fund the development of Moodle’s core platform. So, while other kinds of adoption may be great and may bring in new participants to the Moodle community, Moodle advocates should be concerned with higher education institutional adoption if they are concerned with having development resources for the Moodle platform in the long term. Martin ended his comment on this topic by saying what makes our project different is that we are not driven by numbers. We are driven by the needs of our users and that he would be happy if there were only 100 universities using Moodle if we are following that approach. From an abstract philosophical perspective, this is undeniably true (or was at the time the comment was made, at any rate). An open source project does not need to satisfy investors or meet revenue targets. It just needs to attract enough developer resources to keep the code base viable and up-to-date. But there are a few serious problems with this argument in Moodle’s specific case. First, Moodle’s growth model was spectacularly successful in its first decade in part because it was a Robin Hood model. In richer countries, adopters could afford to pay hosting or management companies to run their mission-critical instances. A portion of this money would flow back to Moodle Pty and get invested in the salaries of developers who would improve Moodle and continue to release it under an open source license. In poorer countries, they could adopt Moodle themselves without paying a hosting or support vendor. Moodle has always been unusually easy to install and run on even modest hardware relative to its competition, so poorer schools could still manage to adopt it with the resources that they had. But if Moodle is losing ground in the richer countries (or, more accurately, the countries that can invest and are investing more dollars in educational technology), then it is also losing its development revenue base. But the problem is potentially worse for Moodle, because we’re beginning to see a pattern take hold in international markets as they reach a certain level of maturity, and it’s not good a good one for Moodle. In the US and Canada, the big hurdle to LMS migration was the move from self-hosted to cloud. 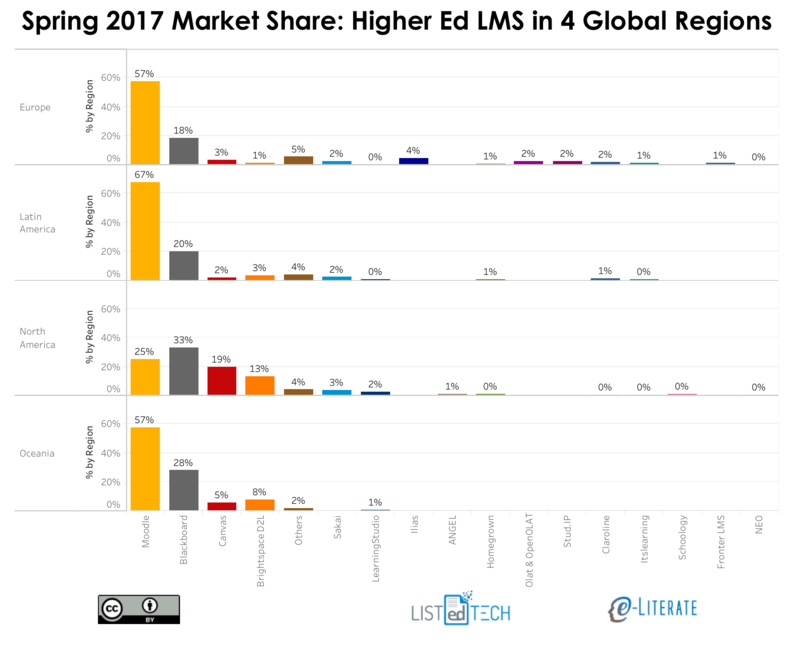 Once institutions became comfortable with cloud hosting, the market changed rapidly, with Canvas in particular taking a strong lead and Moodle (among others) losing ground. We are seeing early evidence that the same pattern may be beginning to take hold in Europe now. While the data we have are not definitive yet, they are suggestive and are supported by the qualitative research we are doing. And this pattern could easily take hold elsewhere as well. For example, my colleague O’Neal Spicer and I recently had the good fortune to visit Brazil, where Moodle is still very much dominant. But consider this: Seventy-five percent of Brazil’s college students go to for-profit universities, and those businesses are enormous and growing. For example, Kroton, the country’s largest university, has about 2 million students. Given that these organizations are companies with investors and profit motives, there is no particular reason to believe that they are ideologically inclined toward open source. The fact that both Instructure and D2L have offices in São Paolo suggest that they believe they have an opportunity to win over the Brazilian market now that it has gotten big enough to be profitable for them. In other words, Moodle’s Robin Hood model is under threat because whenever a market becomes rich enough to generate significant revenue for Moodle Pty, it also becomes rich enough for universities to consider switching to cloud hosting by one of Moodle’s commercial competitors. Adding to this pressure is the fact that Moodle Pty just took $6 million in investment money. This is not a grant; it is an investment. However well-aligned and patient those investors may be, they still will eventually need to see a return on their $6 million. When investors do not see the return they expected, they eventually begin to put pressure on the company management to take steps that improve the finances. I don’t know enough about the terms of this particular investment relationship to know what kind of leverage Leclercq has to push for changes in Moodle Pty if they are not happy with its performance, but the fact of the matter is that Moodle Pty now has financial performance targets to meet. Put all this together, and it strongly suggests that members of the Moodle community should be concerned about the adoption trends we are seeing, for both mission and strategic reasons. I want to return to the example of Brazil for a moment to show why this matters not just to Moodle advocates but to anyone who cares about education. According to the 2016 Analytic Report of Distance Learning in Brazil published by Brazil’s premiere distance learning association, the Associação Brasileira de Educação a Distãncia (ABED), about three-quarters of a million Brazilians took online or blended courses in 2016. According to our analysis, Moodle has over 80% of Brazil’s higher education institutional LMS market share. It’s entirely possible that we would not have seen that kind of growth in access to education if Moodle had not existed. Yes, one or more other open source LMSs might have been adopted, but the existence of that Robin Hood sustainability engine built by Martin Dougiamas ensured that significant developer resources went to developing a high-quality globally adoptable LMS that could be deployed by even poor institutions. It has been an engine of educational growth. If the data patterns we are observing hold, then that engine may be under long-term threat. While Moodle has far too broad an installed base to disappear any time soon and just received an infusion of investor money, the fact is that its sustainability model is now in question. That’s bad for everyone. It’s bad for Moodle advocates, it’s bad for people who care about improving educational access for the developing world and economically challenged people in general, and it’s bad for those educational technology companies that have depended on international maturation of markets that open up new commercial opportunities for them. For everyone’s sake, I hope that the Moodle community—and particularly its leadership—owns up to this potential challenge to its sustainability model and confronts it head-on. Michael, we ran into each other at Educause last week, you could have asked me directly about all this there (or by email or phone at any time), but you chose not to. I get that you are a fan of certain companies and that is fine, but I don’t understand the highly negative and uninformed spin from you lately. Look at the title of this article! These feel like intentional attacks, to be honest, and I have to wonder why. Since you brought it up, Martin, let’s put some context around that EDUCAUSE encounter for the readers. It happened on a street corner when you and your colleague were exiting a pub and Phil and I were waiting for Lyft. It was less than five minutes. Our last exchange prior to that encounter was on Twitter, where you criticized a very similar analysis we had made in a prior post and I asked you to provide data or an argument that contradicted our position. Your response was, “See you in Educause in Philly!” So our position about Moodle’s health was very much out in the open and you yourself had made it an agenda item to talk about in person. Yet you did not raise it either when we saw each other on the street; nor did you suggest we meet at a time when we could have a conversation about it. But all of that is beside the point. As analysts, we make inferences based on facts. In this case, every data point in the LISTedTECH data set is a fact. We base our inferences on literally thousands of them—probably tens of thousands if you count the historical data points that enable us to detect changes over time. If you think that our inferences are false, there are a few things you could do to make your case. First, you could provide alternative apples-to-apples data. Your Moodle Partners know their exact customer counts as well as their wins and losses over time. I don’t know if they share this information with you—I’m guessing they must do some kind of reporting, since they have to justify their revenue share contributions—then you could publish the data regarding trends in revenue-contributing Moodle adoptees. You could do that in a way that would enable the data to be validated while still protecting the privacy of partners and customers by simply providing country-by-country aggregate data. If you did that, I guarantee we would take those numbers seriously, look at them closely, and write about them. Another set of facts you could provide is details of the financial performance of Moodle Pty. Both Apereo, a non-profit foundation that supports an LMS, and Instructure, a publicly traded for-profit company that supports an LMS, regularly publish reasonably detailed information about their financial health. As a private company, Moodle Pty is not legally obligated to do the same, but nothing prevents you from providing a level. of financial disclosure that is similar to either of these other organizations. You mention a number of initiatives that you claim are revenue-generating. We are, in fact, aware of many of them and have even written about some of them. We have no facts suggesting that the revenue they generate is sufficient to be material to the financial health of Moodle Pty. If such facts exist, you are the one who has them. Again, if you are willing to share those facts on the record, we would certainly consider that to be newsworthy. Regarding your insinuations that we are biased, we generally don’t defend ourselves against such accusations. While we try our best to be fair, any person is capable of unconscious bias. We are therefore not the best people to judge our own objectivity. Luckily, there are about 13 years of data points in the form of blog posts here on e-Literate. We are content to let readers make their own judgments about that question. But on the specific topic of Moodle, Martin, you know what we think and you know how to reach us. We are always open to talking. But we are going to write the analysis we believe to be true based on the data that we have. And if somebody publicly challenges our analysis, as you have done on multiple occasions, then we may choose to publicly respond in an effort to clarify our rationale. That is not an attack; it is an explanation. It’s possible that the accounts that Moodle has lost to Canvas were not big revenue generators for Moodle. How many of those accounts were self-hosted and self-supported? I don’t have any data, just a question. Good question. We haven’t yet figured out a way to track conversions from self-hosted to vendor-hosted Moodle. (George Kroner at Edutechnica has apparently come up with a bit of magic in is crawler that can figure this out, but we haven’t been able to reproduce it ourselves yet.) But we do have enrollment figures on the schools in the data set, and since LMSs are licensed by registered users, we could probably do a comparison of school loss versus enrollment loss. Once again, it would be directional rather than definitive outside of the US and Canada, but it would give us a sense of the magnitude of the change many of the markets where the big commercial competitors are beginning to show up. That’s a good item to add to our to-do list. The other question I have about this trend is how much the Unizin bulk deal with Instructure/Canvas had to do with this trend. Yes, that is a quote of our work, and you have correctly pointed out a limitation to our data. Those figures count a “new implementation” as a move from one platform to another. So it doesn’t capture moves from self-hosted Moodle to vendor-hosted Moodle, or from self-hosted Blackboard to vendor-hosted Blackboard, for that matter. So the global take-away is that we may be understating the trend from self-hosted to SaaS. The Moodle-specific take-away is it is possible that the damage to Moodle Pty’s revenues from schools leaving Moodle altogether is being mitigated somewhat by a move from self-hosted Moodle to Partner-hosted Moodle in ways that are not visible in our data set. While we have not heard anecdotal evidence suggesting this is a trend, we can’t rule it out at the moment. We’re still looking for ways to capture this information, but Moodle Pty could clarify this question easily by publishing quarterly financial statements that show aggregated Partner adoptions and revenues broken out into high-level categories. (As you pointed out in your comment, adoptions do not translate directly to revenues since schools pay by the user.) The level of transparency I am suggesting is consistent with common practices among many for-profit and non-profit organizations. We would be happy to have Martin provide data that would change our hypothesis.